The Union of Arab Securities Authorities (UASA) Board approved the 12th annual report and financial statements for the year 2017 during its annual meeting held in Lebanon on 28/03/2017. The report presents the most important activities of the members in market regulation and oversight, enforcement, awareness and cooperation. 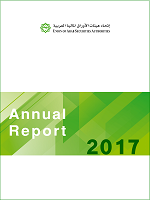 The report also presents the most important work of the UASA completed in 2017 such as the organization of the 2nd Arab Regulators’ Corporate Governance Forum with the Arab Monetary Fund and in association with the International Finance Corporation (IFC) and the Organization of Economic Cooperation and Development (OECD) and GCC Board of Directors Institute (GCCBDI). In addition, the UASA, within the framework of the UASA’s strategic plan 2016-2020 objectives, implemented a number of specialized training programs in line with the requirements and training needs of the Union members to contribute in the development of self-regulatory capacities and enhancing the efficiency and effectiveness of regulatory authorities in various areas. The training programs specifically targeted the human cadres working in the regulatory authorities at different levels of employment, especially those working in regulatory and supervision aspects of capital markets institutions. Some programs also targeted other entities operating in the capital markets, including exchanges, depository and settlement centers, brokerage firms, listed companies, banks, financial institutions and other entities related to the capital markets. Furthermore, the UASA setup a data base for the Members’ legislation, developed a reference guide on corporate governance rules and principles in line with the international standards, issued two studies; the first on tender offering in Arab capital markets and the second on corporate governance of listed companies in the Arab financial markets, and issued a comprehensive glossary of the most important financial terms used in financial markets. The UASA issued also a booklet marking the tenth anniversary of the UASA establishment. The publication of this booklet was made to shed light on the major milestones and development of the UASA including its establishment and the most important achievements, its committees and task forces, as well as an overview of the UASA’s Strategic Plan for the years 2016 - 2020. The booklet also presents the most important activities of the Union, particularly those related to capacity-building, conferences and seminars, publications, and international cooperation. The booklet also contains a list of the UASA members and their joining date, and the Authorities which took over the presidency of the Union since its establishment. The annual report featured also the completion of the work related to the development of UASA’s website, especially with regard to the establishment of the investors’ education and awareness e-portal, as well as the issuance of the UASA quarterly e-newsletter.